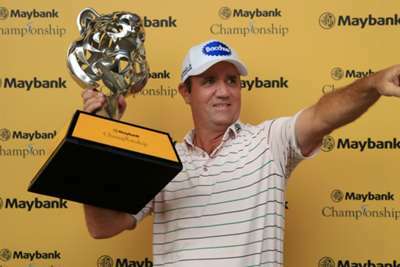 Scott Hend overcame Nacho Elvira in a play-off to triumph after a weather-delayed finish to the Maybank Championship in Kuala Lumpur. The Australian produced a birdie blitz on the front nine - carding five in total before the turn - and led by one shot as the final group, which included Elvira, teed off at the 18th hole. However, heavy rain and thunder forced the players off the course before they could complete the last, with the break in play lasting more than 90 minutes. Elvira duly returned to the green and sank a long birdie putt to join Hend at 15 under, meaning the duo needed a play-off to decide who would be crowned champion. Hend needed only one hole, though, making the most of his wayward tee shot at the par-five 18th finding the fairway via a deflection off a tree to record a birdie and clinch his third title on the European Tour. "I'm a grinder and a fighter," said Hend. "So is my caddie Tony [Carolan]. We both have the same mental attitude. It doesn't matter how old we are, we work hard at what we do. It just takes a bit of luck to win. Elvira had led overnight but narrowly missed out on glory again - he finished in a tie for second in his previous start, at the Qatar Masters. Jazz Janewattananond sat alone on 13 under, one ahead of American Johannes Veerman as England's Oliver Fisher and Maximilian Kieffer of Germany ended tied together on 11 under. Ernie Els was part of a six-man group a further shot back, giving the South African the 300th top-10 finish of his illustrious career.